Here to celebrate our anniversary with my favourite cuisine. Read from other reviews that the service is poor so we braced ourselves. When we arrived, we were seated and the restaurant was only running on 20% capacity for lunch. During ordering, staff was helpful to give advice on the food items. I was pleasantly surprised with one of the service staff who over to fasten a back cushion for me. That's awfully sweet of him to go to that extra mile for me. 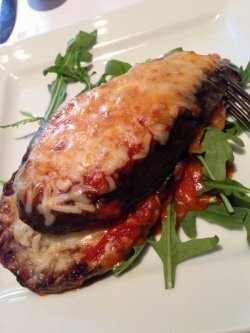 Grilled Eggplant - tender slices of eggplant grilled till soft and then served with melted cheese and tomato sauce over them. Perfect starters! Calamari - I think this dish fell short somewhat. 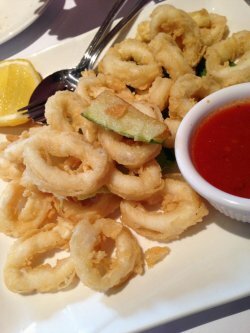 The batter was soft by the time we ate them and though the serving size was quite generous, I found the calamari rather bland. If not for the tomato dip that accompanies the rings, it would totally tank. I won't order this again. Ravioli Con Carne - this is our best pasta dish of the meal! Little pillows of soft beef dressed in a strong tasting cheese sauce, something like blue cheese but not. Just really yummy lah! Before our Squid Ink pasta arrived, we were both offered bibs that they nicely secured on for us. I supposed if the black sauce splatter on you, it'll be quite a nightmare to remove. So thoughtful!! 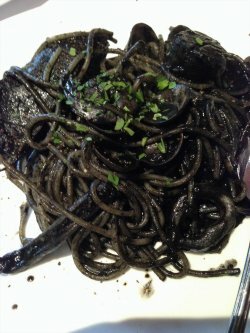 Squid Ink Seafood Pasta - quite a big plate of pasta that is a whole plate of Nero (that's Italian for black) goodness. Seafood is fresh and generous in amount. The squid ink sauce is very flavourful and every mouth of al dente pasta a party in the mouth! Spinach Ravioli - very good ravioli with tomato sauce. Not that this is not nice, it IS but this dish does pale in comparison to the other 2 pasta dishes. 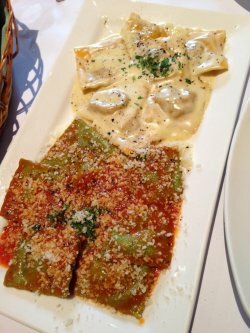 You can opt to have a half half of the Ravioli pastas on the same plate. This is what we did so we got to taste more without being too full!! 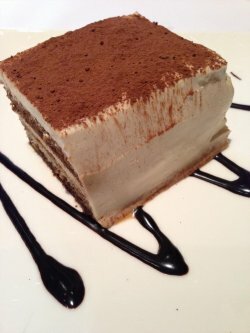 Tiramisu - a nice generous square of cake. You can really taste the rum in it (nice!) and with the mascarpone cheese cream, a wonderful slab of heaven to finish up the meal. I dunno why so many complained about the poor service because we have enjoyed very good service, not just from one service staff but all round really. Will definitely be back to savour the rest of the menu!